The National Lawyers Guild (NLG) is dedicated to progressive change in the structure of our political and economic system. It was founded in 1937 as the first racially integrated U.S. bar association. 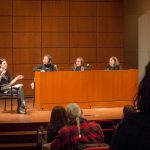 Student chapters of NLG sponsor annual events like Disorientation, which provides progressive law students with a sense of community and support in an educational environment that can often feel alienating and disheartening. We also train students on how to monitor police misconduct so they can volunteer as Legal Observers at local protests. 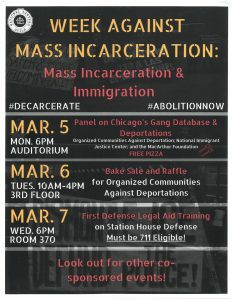 Please join National Lawyers Guild – Chicago-Kent Chapter for a panel discussion about the Chicago gang database and how ICE is using it for immigration enforcement. Officially known as the Strategic Subject List (SSL), the gang database is a “predictive policing” tool that CPD uses to surveil and target black and brown communities. The content of this deeply flawed database is being shared with ICE, leading to arrests, detention, and deportation actions against Chicago residents. Join us on Tuesday, February 9, to honor Fred Korematsu, a civil rights hero. In 1942, at the age of 23, Korematsu refused to go to the government’s incarceration camps for Japanese Americans. After he was arrested and convicted of defying the government’s order, he appealed his case all the way to the Supreme Court. In 1944, the Supreme Court ruled against him, arguing that the incarceration was justified due to military necessity. In honor of Fred Korematsu day, we are holding a special screening of the documentary “Of Civil Rights and Wrongs” followed by reflections by a group of panelists, including a former internee of the Japanese internment camps. So excited for the NLG Convention this week! It’s rare that all of the NLG chapters assemble in Chicago, so try to stop by at some point if you can. And law student registration for all 5 days is only $75 (that’s only $15 per day)! Here’s a sampling of just of the great workshops being offered next weekend: … Continue reading It Has Arrived: The NLG Convention is THIS Week!